So here we are, well past the 4th of July and gas prices are still falling. They were projected to be more than $4 a gallon by this point in the peak travel season. But we are paying less than $3.50 a gallon on Cape Cod, closer to $3.30 just over the bridge and almost $3.00 a gallon from the states our visitors come from. T hat's good news for us right? It should also be good news for the President, who for some reason gets the credit or the blame for gas prices even though he virtually has nothing to do with it. Gas prices are determined by the supply of oil, and the producers of the oil decided to sell more of it at lower prices rather than less of it at higher prices. I don't pretend to know why, I just know that the President had little to do with it. So why then, when prices begin to go up again, will he get the blame for it? Answer, the subject of this blog, politics. Gas prices are a blunt instrument that politicians get to blodgeon each other with because the average citizen doesn't really understand the economics behind it. So here we go again. Gas prices go down, Obama takes the credit. 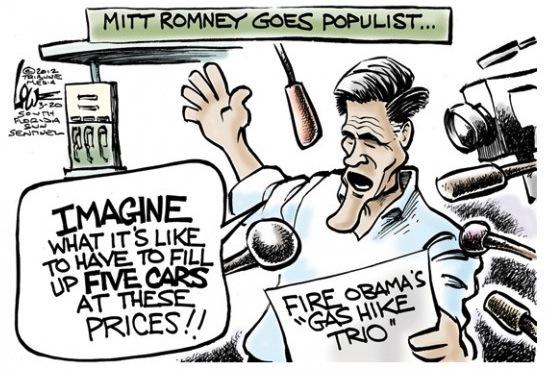 Gas prices go up, he gets the blame. The oil companies make record profits either way.